The bicycle rack bag is absolutely essential if you want to ride in comfort on your bicycle. No more sweaty uncomfortable back from your rucksack, particularly important for commuters who don’t want to arrive at work a sweaty mess! They are very easy to fit on most modern bikes. Like a pannier, they are fixed to a rack over the back wheel of your bike. However, unlike panniers, which hang either side, these bags sit on top. If you are riding a fixed wheel or ‘fixie’ bike then it can be a bit more tricky to mount the rack as they tend to be very minimal and lack eyelets required. Best for… those with small loads who don’t want a sweaty back. If you are carrying more weight your best option is to look at panniers. if you are carrying a really small amount of essentials then saddle bag should be sufficient. These are a great, lightweight option for those who don’t have too much to carry. Sat on top with zip compartments, it’s easy to get things in and out quickly. Thanks to their position, they produce less wind resistance than a pair of panniers hanging either side of the back wheel. This also makes for a more comfortable ride as the weight is more centralised on the bicycle however depending on the type of bike it could also mean that the bike is less balanced due to the weight being higher up. It is a good idea to adjust the amount of weight in the bag and position to get it right for you. One of the main considerations is keeping the contents of your bag dry. If this is important to you make sure the product you buy is waterproof. Whatever bike you’re riding, whether it’s a mountain bike or a racer, there are a few key items or accessories that you simply cannot do without, for example a helmet or lights, but how about a bike bag? You could be forgiven for thinking that it’s superfluous addition to your bicycle, taking up space and adding weight to your ride. Don’t be swayed by the naysayers though, the majority of products take up what is essentially ‘dead’ space and actually help to distribute the weight for an easier riding experience. There are alternatives such as messenger bags or rucksacks, compare it with the humble bike bag however and the alternatives all seem rather cumbersome. The true beauty of the bike bag is its convenience, within reason there’s no limit as to what you can’t take on your journey, with this product you’ll no longer need to decide what’s essential and what’s not, if you want to take it you can – it really is that simple! This is the more common of the varieties, mainly due to the additional space that can be afforded at the back of the bike, above the rear wheel. As its larger in size than other types, the way in which it is secured is key to the amount of weight and subsequently cargo it can carry. Typically able to handle loads of up to 80 pounds it is secured via bolts that have been threaded through the eyelets located either side of the rear wheel hub and below the seatpost. The ability to handle more weight and offer more room without interfering with the any important features is by far the biggest draw of the rear mounted rack. In some respects the seatpost mounted version is very similar to the fixed rear mounted, it does possess some qualities though that its bigger brother does not, most notably of which being its versatility. As it’s only mounted onto the seatpost via a clamp with built in retaining screws, fitting and removing can be done with considerable ease. Although it’s worth mentioning that this added flexibility comes at a price, in the form of a reduction in the amount of load the seatpost style can take. Similar in principle to the rear mounted variant, this is used to great effect with small loads or if extra space is required in addition to a main rear mounted. Due to the nature of its design and the fact that it’s normally only anchored by a single bolt centrally located by the front fork, it can only carry lightweight loads. However it’s still useful for carrying smaller items and making the most of the available space on your bike, most front mounted can take an average of 15 pounds of weight. If the idea of a front mounted still appeals look out for the models with a double anchor point, as the maximum weight capacity is generally much better. Still situated at the front of the bike the low rider makes use of the central bolts that thread through the front wheel, locking it into position and enabling riders to fix pannier bags either side of the wheel. One factor to consider with a front mounted rack is the steering and due to the lower centre of gravity and better weight distribution, with a low rider rack it’s possible to carry heavier loads without compromising on manoeuvrability. 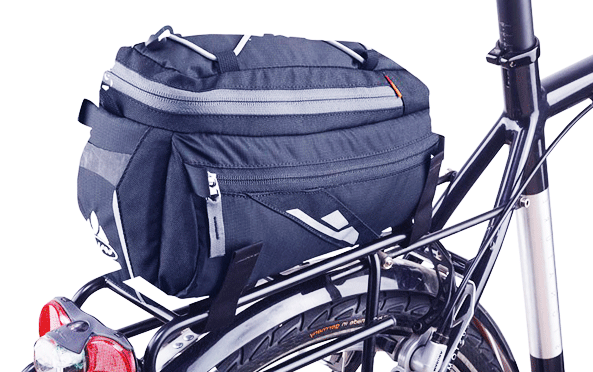 – Still a firm favourite within the cycling community, the pannier comes in many shapes and sizes but are most commonly found in a bag or box format. – What sets a frame bag apart from the alternatives is that it doesn’t require a rack, instead it utilises a system of vinyl clamps or straps that allow the bag to securely hang from the bike frame. – Located directly below the saddle, this small and subtle addition to your bike can come in very handy for small personal belongings or emergency equipment such as puncture kits. – There was a time where messenger bags had to be worn whilst on a bike; thankfully that’s no longer the case! Through clever use of closures and straps, a messenger bag can be worn whilst on foot and attached to the bike whilst riding. It’s this advancement that’s given rise to the number of designer bike bags available on the market today. Of course there are a number of different products on the market which allow users to carry all manner of items from groceries to laptops. With that said the items that an everyday commuter on a city bike will need to carry will greatly differ to the needs of an avid mountain biking enthusiast, the following section details the different bike racks or bags available and matches them based on their suitability. This is where the benefits of having a large scale bike rack and bag setup on your cycle really come into their own. As touring bike riders’ clock up hundreds if not thousands of miles, over a number of days, weeks and in some extreme circumstances even years, carrying the right kit is essential which makes this bit of kit indispensable. The length of your journey plays a determining factor in selecting the right kit, start out with the basics and work your way up as the required capacity increases. A rear rack is undoubtedly the best place to start, particularly one which will allow a large pannier box and bags to hang down either side, if required follow this up with a low rider front rack or a larger dual anchored front rack which like the rear variant will allow for panniers either side and on top too. Of course with the latter option care should be taken to ensure that the loads and the panniers themselves do not infringe or interfere with the pedals or steering! As the name suggests a commuter bike is most commonly uses to travel to and from work, needless to say whatever your profession may be the ability to safely stow away what you would otherwise end up carrying is priceless. Ideal for city slickers that need to carry their work files or laptops with them or simply a fresh change of clothes, a simple yet spacious rear rack and pannier will hold almost anything you want (for more specialised bags see our section below). Although undoubtedly better suited to the likes of touring or city bikes there are similar products specifically adapted for tackling the challenging conditions facing the average mountain biker. Obviously a front facing rack or a seatpost rack would be too flimsy and a low riding rack isn’t suitable due to the treacherous terrain. That leaves us with the option of a rear rack or alternatively a saddlebag or frame bag, the latter being much more inconspicuous and all round better suited to a mountain bike. So what exactly do you need to take with you on a mountain bike? The good news is nothing to big which again plays to the strengths of the smaller bags, items like repair kits, spare tubes, tools and refreshments are all pretty essential to the accomplished rider. As a sport that’s physically demanding to your body the addition of this leaves you free to move your body, allowing riders to adjust to the bends and bumps of the trail ahead. As the hybrid is suitable for every occasion it’s only natural to combine it with an equally efficient and multifunctional version. As yet there’s not a single specific bike rack with the same traits as the hybrid, so it really depends on what you’ll be using your hybrid bike for. One option is combining the easily installed/removed bike rack variants such as the seatpost rack or frame bags, this allows an almost seamless transition between commuter and active style riding. It’s worthwhile mentioning that not all of the bike racks or bags are manufactured to carry a generic number of items. However useful this may be there are a number of specialist products available too, all designed with a specific product in mind. Unsurprisingly this style of bag has proven hugely popular with city dwelling commuters, an adequately sized laptop bag will offer more protection than its conventional pannier style counterpart, whilst also allowing users to remove the whole bag with ease and use as a messenger style bag. Designed with paperwork in mind, the office bag secures everything safely away in its many compartments, encasing them in a waterproof outer skin. Normally located on the stem of the bike, the phone bag allows riders easy access to their mobile and hands free compatibility whilst riding, whilst simultaneously offering protection from the elements via its secure transparent waterproof pouch. The beer bag – Worth an honorary mention the beer bag is a sling-like frame bag, which can accommodate any single bottle of liquid from beer and wine to plain old water. For the majority of bike racks all that’s required is the tightening of a few bolts on the bikes frame, for instance a rear mounted bike rack is secured via the bolt eyelets on the frame, which is certainly simple enough to install, however if you’re riding an image conscious fixie or a laid back cruiser then it can dramatically upset the visual appeal of the bike. Thankfully there is an alternative in the form of vinyl clamps or clips, which can entirely eradicate the need for bolts, protecting and in some cases enhancing the aesthetics of your bike. Finish this look of with the great range of designer bags on offer, such as Basil or Hill & Ellis and you’ve got the perfect blend of practicality and style! Of course you can pay a visit to your local bike store; however upon browsing through their wares you may find the selection on offer to be somewhat limited. All the standard product lines should be there, consisting of the likes of box or bag format panniers or rear mounted racks, but with this particular market sector being so progressive and diverse the best selection will always be found online. Any virtual marketplace worth their salt will have a vast array of market leading racks and bags, with this in mind try searching for bike racks on Amazon or eBay. A simple search will display a wealth of the latest innovative products, of course you will need to filter out the good from the bad but that’s where we come in! Using the information within this guide you can narrow down your search to only the most relevant products, ensuring you select the rack and bag that fits in with your cycling lifestyle. For those with more eclectic tastes there are a wealth of independent retailers operating online too, here are a couple of our favourites. EMK cycles – Offering a diverse selection of quality products, EMK cycles cater to every conceivable need. With a focus on premium items EMK cycles stock a range of racks and bags that offer style and functionality all neatly rolled into one package. Roswheel – If it’s something different you’re after then look no further than the ridiculously cool products offered by Roswheel! Fancy a handlebar mounted phone holder? How about a heavy duty three piece rear pannier system? All of the above a much more can be found by browsing through Roswheel intuitive and easy to use site. That’s right, you heard it here first, manufacturers are now integrating technology into their products and it raises many questions but namely how and why? Technology has been a part of cycling for a good number of years now however with the rise of the smartphone everyday objects are undergoing dramatic transformations. Smart devices are already changing the way we communicate, socialise and go about our day to day lives so why not incorporate technology into bike racks and bags, especially if the following products are anything to go by! Consisting of a dynamo powered battery charger and a protective handlebar bag that can house tech as large as a tablet! Stem mounted phone bag – Of course it great to have access to your phone whilst riding, look a little deeper, past the conventional features and there’s a hidden gem in the form of GPS. Essentially this is a satnav for bikes – enough said! As the bag has no contact with your body, cycle rack bags won’t make you sweat any more than usual apart from the extra effort of pushing the bike of course! As they fit on the top of your bike rack, there is only limited space in a rack bag. As the weight is higher on the bike than when using panniers, this can make the bike a bit more unstable. Slung over the shoulder and really easy to take on and off. Check out our guide to find out about your best courier messenger bag options for your bicycle. A bit girly but can be really practical way of transporting a small amount of stuff, ideal for quick trips to the shop. Check out our guide to find the best bike basket options for your cycle. How do you carry your stuff to work? Do you have any innovative solutions to carrying things while you are on your bike? Drop us a line we would love to hear from you.